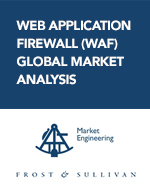 Research findings offer market perspective and a four-year web application firewall market overview. The need for organizations to recognize a rising threat level as web applications are particularly vulnerable entry points for malicious actors. The evolution of WAF solutions beyond defending against the traditional Open Web Application Security Project (OWASP) Top 10 threats to keep with the increasingly sophisticated threat landscape. Competitive WAF solution vendors must excel at accuracy and scalability without loss of performance or application availability.